By global standards, crime is low in America. After all, we have the highest incarceration rate in the wold with over a million criminals behind bars. Yet Americans are a scared lot who rush to buy home monitoring cameras and services. Benefiting from the unusual fear of Americans are startups like Dropcam that offer low-cost home monitoring WiFi video cameras and related services like cloud recording and storage. This morning the San Francisco company announced it had raised $30 million in Series C funding taking its total financing to $47.8 million. Institutional Venture Partners led the latest round in which existing investors Accel Partners and Menlo Ventures, and new investor Kleiner Perkins Caufield & Byers participated. Dropcam plans to use the proceeds from the C round to hire more engineers, add new products and expand its sales channels. The startup’s namesake product Dropcam HD offers 720p streaming, night vision, two-way talk back, and digital zoom plus optional cloud recording services. Owners can receive alerts via e-mail or smartphone (supports both iPhone and Android), view live footage on their mobile devices and talk directly to people and pets. 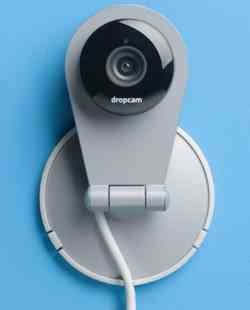 The company says Dropcam HD shipments have been quintupling every year since it launched the camera in late 2009. Dropcam HD costs $149 and can be purchased at the company’s web site or Amazon.com. Cloud recording services are extra. Reviews for Dropcam HD have been mostly positive on Amazon. Of the 860 reviews (as of July 31, 2013), 604 carried a 5-star or 4-star rating. Greg Duffy and Aamir Virani founded Dropcam in 2009.